a private chess engine by Vincent Diepeveen, written in C. The development started in 1994, and so far stopped in December 2012 . Since 1999 Diep performed a parallel search on SMP, and later on NUMA multi core systems, and occasionally on Super Computers but unfortunately without too much support for testing. 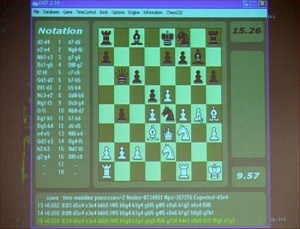 Diep's most successful year was 2004, when Diep won the Dutch Open Computer Chess Championship in 2004 , and won the Bronze Medal at the WCCC in Ramat Gan . Diep spawns processes for its parallel search. Due to its enormous chess knowledge implemented in its evaluation, Diep was not a fast but knowledge based searcher. Diep is without doubt the strongest chess analysis program in the world at infinite level (few hours a move). The longer you allow it to analyse the better the move it will produce, something which is uncommon for most other chessprograms, caused by the enormeous chessknowledge in Diep, which is at the time still considerably growing every month (and decreasing the Diep searchspeed). Diep was one of the most active programs in official tournaments. It played three World Microcomputer Chess Championships, the WMCCC 1997  , WMCCC 2000 and WMCCC 2001, seven World Computer Chess Championships, WCCC 1999, WCCC 2002, WCCC 2003  , WCCC 2004, WCCC 2005, WCCC 2006 and the WCCC 2007, various Dutch Open Computer Chess Championships, ICTs , IPCCCs, the IOPCCC 2007, CPTs and CCT Tournaments. Diep, while playing tournaments, had various book authors over the time, Carlos Pesce at the WMCCC 2001, Eros Riccio at the WCCC 2006, and Arturo Ochoa at most other tournaments. This page was last edited on 1 July 2018, at 09:42.